Follow this list to discover and track stocks that have gained the highest number of new hedge fund holders in the last quarter. Netflix is facing increasing pressure from traditional networks as the streaming landscape gets more crowded. GAMCO Chairman and CEO Mario Gabelli, the legendary value investor, gives his take on the streaming space with Yahoo Finance's Dan Roberts, Jen Rogers, and Myles Udland. 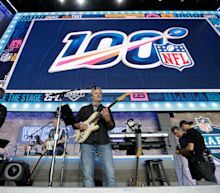 The NFL Draft will be a big boon to host city Nashville, but on the broadcast side it's big for Disney—the first time ABC is airing all three rounds. PayPal CFO John Rainey sits down with CNBC's Deirdre Bosa to discuss Venmo's path to profitability, Instagram's new shopping feature and release of its number of users. Boeing reported a drop in first quarter profit in the wake of two fatal crashes involving its flagship 737 Max 8. The U.S. Federal Aviation Administration said Thursday it is inviting top civil aviation officials from around the world to a May 23 meeting to discuss the now-grounded Boeing 737 MAX. The aircraft has been involved in two deadly crashes since October. The FAA, which did not disclose where the meeting will take place, said that at the May 23 meeting it will "provide safety experts to answer any questions participants have related to their respective decisions to return the fleet to service." It will not include Boeing at the meeting. Boeing missed earnings and revenue estimates in Q1. The U.S. Federal Aviation Administration said Thursday it is inviting top civil aviation officials from around the world to a May 23 meeting to discuss the now-grounded Boeing 737 MAX. The aircraft has been involved in two deadly crashes since October. A recent opinion by the U.S. Justice Department has put a handful of states in danger of losing at least $220 million in annual lottery profits that they use to fund college scholarships, senior citizen services and a variety of other programs. The states are anxiously waiting on a clarification from the Justice Department about its opinion that, if strictly interpreted, would outlaw lottery tickets sold online and prohibit all lottery-related activities that use the internet, including popular games like Powerball. Congress enacted the Wire Act in 1961 to target the mob's gambling activities by prohibiting wagering across state lines. Ticket sales reached more than $107 million in China alone, setting a record for single-day box office. The big drugmaker beat Wall Street estimates in the first quarter thanks to solid sales growth for its top blockbusters. The news comes on the heels of a report in which Synchrony Financial may issue Venmo's first-ever credit card. Although analysts had widely expected the aircraft manufacturer to report poor numbers, the actual results were even worse than expected, with both revenue and earnings per share missing expectations significantly, as the worldwide grounding of the 737-MAX weighed heavily on the company. Warning! GuruFocus has detected 1 Warning Sign with GH. First quarter earnigns per share were $3.16, down 13% year-on-year and missing consensus expectations of $3.25.